When I joined the Tugboat Institute team in May of this year and sat in on my first team Huddle, planning for Tugboat Institute Summit 2018 was reaching its peak. That first week and throughout the days that followed, leading up to the event’s start on June 26, all things Tugboat Institute Summit were front and center. 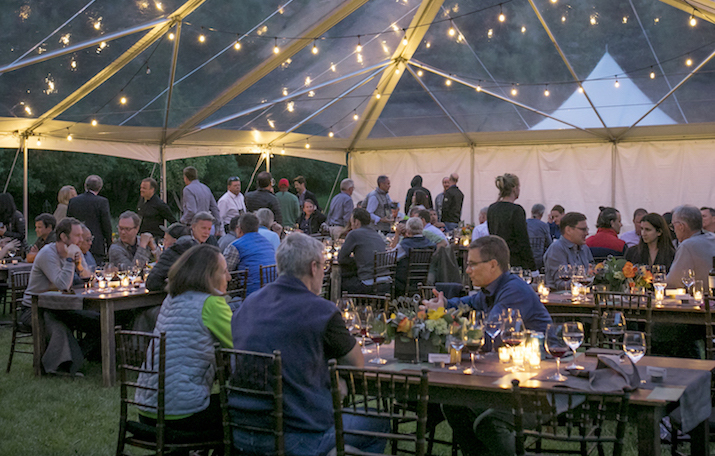 The commitment of the Tugboat team to ensuring that each attendee had an extraordinary and inspiring experience was clear, as was the joy and gratitude for the opportunity to gather this group of Evergreen leaders to learn and inspire one another in our stunning mountain town. What I couldn’t know in those weeks was what the event would actually feel like. Because you do “feel” the Tugboat Institute Summit experience. The generosity and wisdom that come together in this week are tangible, as emotions and knowledge are shared openly among members. From my first introductions to new members at our inaugural First Year Orientation, I saw how quickly the armor of professional personas was relinquished, giving way to warm, personal interactions. As new members met one another and learned what they could look forward to in the days ahead, members who had experienced the event shared insight into how to make the most of the gathering and answered questions to ensure those attending for the first time felt at home and well-informed. Moving from that First Year Orientation through the first evening’s events reaffirmed the spirit of connection and curiosity that would continue to fuel the week’s activities. As we gathered for dinner, the greetings and conversation among members—old and new—spoke to the friendships and professional respect that bind this group. The laughter and strategizing that followed as the group worked in teams to build fantastical structures in the first icebreaker activity reflected what everyone was already feeling: this was going to be an amazing week. As they do each year, the TED-style talks that began on day two displayed the defining characteristics of our Tugboat Institute Summit attendees: deep wisdom paired with deep understanding. Greg Twardowski brought the principles of People First and Purpose to life in his presentation, as he described the loyalty and commitment of his employees and the emotional connections that have been fundamental in the growth of his Evergreen security business. Greg set the tone for the candid, heartfelt talks that would follow throughout the week. Alongside the deeply personal stories of Purpose present in this year’s talks was a parallel thread of practical application and strategy, offering the CEOs, Presidents, and Founders gathered tactical steps and insight to bring home to their businesses. A panel discussion led by Dave Whorton, with Spencer Burke, of the St. Louis Trust Company, Kim Sheehy, of Fidelity Family Office Services, and Loren Feldman, Senior Editor at Forbes, offered welcome insight and ideas for founders and CEOs of multi-generational family businesses. Thursday’s talks provided further lessons, both practical and profound. Among the day's presentations, Tom Rosztoczy shared the story of Stotz Equipment’s growth through acquisitions; Bobby Jenkins spoke to the foundation of family (and Texas A&M) that guides ABC Home and Commercial Services, and Jay Wilkinson described the deeply rooted culture present at Firespring. There could have been no better conclusion to this year’s presentations than Joe Motz’s deeply moving talk, “Finding the Joy in Unpacking.” Initially hesitant to speak at Tugboat Institute Summit, Joe delivered a talk that connected all the pieces of personal growth and professional success for many members. In offering his own journey of letting go of that which did not serve him to more fully embrace positive attitudes and practices—in business and in life—Joe’s talk ignited the better spirit of Tugboat Institute members. Whether a member’s ah-ha Evergreen moment this year came though one of the presentations, in the group art project with Heather Hansen, on the hiking trail, or in a one-on-one-conversation with another member, our hope is that all who attended returned home inspired and recommitted to building lasting, purpose-driven, and private companies. As a team, we are so grateful to have shared another Tugboat Institute Summit with our members and guests, and we hope that everyone who attended will carry the momentum of the experience forward in life and in work. Diana Price is the content manager at Tugboat Institute.